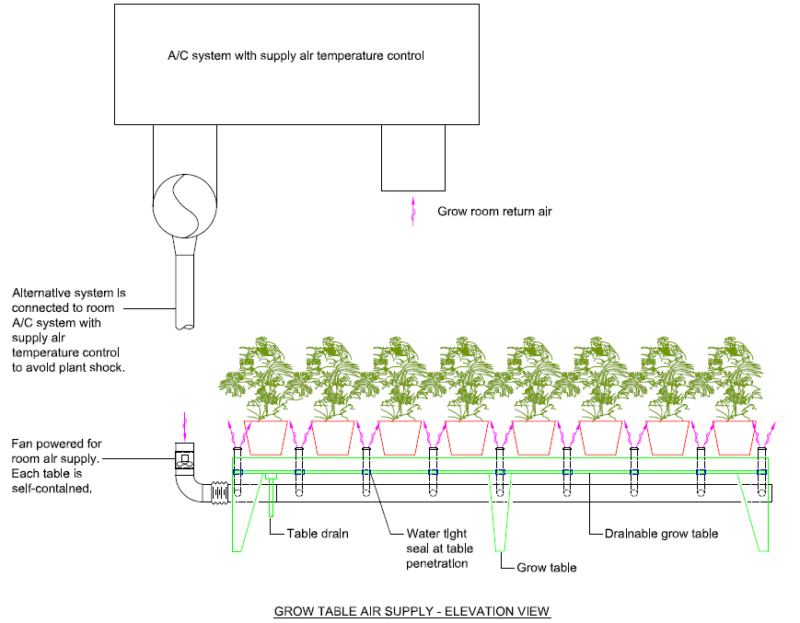 Economical Cannabis Under-Canopy Supply Air System | 15000 Inc.
For many growers the holy-grail of grow room systems is an Under-Canopy Supply Air System. This is something that has been talked about for years as creating the ideal grow environment. However, the physical and economic challenges of such a system have made this impractical, except for the largest of commercial growers. Now, 15000 Inc., working in partnership with local marijuana grow facilities, have invented an economical under-canopy supply air system. While the system is ideally suited for grow table and rack systems, variations of the system can be made to work with floor mounted pots. In addition, the system is completely flexible allowing the tables and/or pots to be moved for plant care or changing grow cycles and room layouts. A controlled breeze on the plants strengthens the stems which creates more robust plants. Powdery Mildew develops on the plant leaves as a result of excess moisture. In rooms with wall or floor mounted fans some areas of the canopy will not receive even airflow. This may allow the fungus to develop. An evenly-distributed under-canopy air circulation system can greatly reduce the likelihood of this damaging pest. Bud rot can be a tragic occurrence. Months of plant care can be ruined near the end of the growth cycle by this flower-destroying pest. An under-canopy supply air system can greatly reduce the chance of this grey mold developing due to too-humid conditions within areas of the canopy. Wall or floor mounted circulating fans have limited speed control and cannot evenly distribute consistent streams of air to all areas of the canopy. Plants that are farther away from the fans receive fewer benefits than those closer to the fans. Plants that are closer to the circulation fans can experience wind burn. An under-canopy system can provide consistent and controllable air circulation direct to every plant. Again, more consistent plant developed is the result. Carbon dioxide depleted air can create dead zones around leaves within the canopy. This can stifle the stomata’s ability to exchange oxygen and carbon dioxide. Under-canopy supply air circulation stimulates the natural exchange of O2 and CO2 within the stomata. An under-canopy supply air system results in even temperature and humidity profiles within the canopy. This will result in more consistent and healthier crops. Crop yields can also be expected to improve. Lastly, every grower knows you must space plants in such a manner to allow air circulation around the leaves. Again, this is to maintain temperature, humidity and air exchange. This need for wider spacing results in fewer plants per square foot of grow room, and of course, smaller yields. The use of a properly engineered under-canopy supply air system can increase the number of plants per grow room by 10 percent or more. While 10 percent of some things may to be significant, a 10% increase in yield per cycle can have a significant effect on your grow room bottom line! So what’s the brilliant and cheap system that the engineering geeks at 15000 Inc. came up with? Let me first say that the cannabis industry is an anomaly in the business world in that there is a greater appreciation that we are in this together. We are part of something unique which brings an emotional excitement unheard of in other industries. This perspective leads us to work together to build and strengthen this wonderful industry. In this spirit we will share our under-canopy design in the hope that growers, large and small may benefit. Allow changes within the grow room layout. The airflow must be adjustable to ensure even airflow to all plants. Must be resistant to corrosion due to moisture and humidity. Be applicable to various types of racking and table systems. Must be light weight to limit any problems with table or rack support. Elegance in engineering results from simplicity. You know you have reached this level when, once you have presented the idea, people say, “That’s it? I could have thought of that!” This under-canopy system is simplicity itself. The 15000 Inc. design employs a light weight, round aluminum duct suspended from the underside of the grow table or rack system. Small, two-inch diameter ducts are branched off of the main duct and are piped up thru the grow table or rack. The small ducts are terminated below the top of the pots. A round directional air outlet supplies between 15 and 20 cubic feet per minute of supply air out of each nozzle. The branch ducts have adjustable dampers to balance the airflow at each outlet. So that’s the under-canopy air distribution system, but where does the supply air come from? There are two primary means for air supply to the the canopy air system. One means of supply air is a simple variation of the typical wall-mounted circulation fans. In this scenario a small in-line blower fan is attached to the main supply air duct and room air is simply circulated through the under-canopy system. This will greatly increase the effectiveness of the air circulation in the canopy for all of the reasons noted above. This simple system can be built by the grower for as little as $500 per twenty foot table or rack system. For larger operations the supply air can be ducted directly from the air conditioning unit. Portability can be maintained by the use of a flexible duct connector and quick-connect straps at the table or rack connection. The ducted supply air system has the advantage of distributing precisely controlled temperature and humidified air directly into all parts of the canopy. It is important to note that this application requires precise control of the air conditioning system supply air temperature and humidity. A typical air conditioning system supplies air at +/- 55 degrees and the relative humidity may be very low. Supplying such air directly to the canopy would not be good for the plants. In order to supply air to the canopy directly from the air conditioning unit you must be able to control the supply air temperature. Not all air conditioning units have this capability. To employ such a system effectively requires specific equipment and an engineer experienced in cannabis grow room design. If you are looking for an engineer to design your grow room and would like to employ an under-canopy supply air system, I would love to talk to you. Call Gary Welch today at 707-577-0363.